Cinderella at the Kitchen Fire, did not envision that in 2014, his delicate painting would be featured in the same gallery space as a Japanese video montage of cats balancing things on their heads and paws. However that is exactly the case at the Blanton Museum of Art’s new exhibition, In the Company of Cats and Dogs. The exhibit, which opened June 22 and runs through September 21, features around 150 diverse works that are meant to provide an expansive look at our relationship with cats and dogs throughout history. “Through especially beautiful and affecting works of art, we hope to make our visitors aware of some of the diverse and complex histories we have had with cats and dogs over a period of 33 centuries,” says Francesca Consagra, the Blanton’s senior curator of prints, drawing and European paintings. The time span and rich set of themes tackled is ambitious but also inclusive. The diverse works weave a story of our ever-changing relationship with cats and dogs and, as Blanton Director Simone Wicha says, “gives a deeper understanding of our own identities and relationships.” Individually, there is a piece in the exhibit for every type of animal and art lover. There are Egyptian sculptures dating from 700 to 300 BCE, including an original limestone drawing of an Egyptian god who is part man, part dog, and a striking dog-shaped vessel curved into the shape of a large serving bowl. 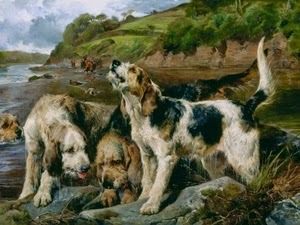 There are a number of impressive and vibrant large, gold-framed paintings that hang beautifully on the green hued walls of the hunting section of the gallery, including a jarring, almost photographic portrayal of a successful hunt by Dutch painter Jan Weenix, known for his skill at rendering fur and feathers. Numerous treasures borrowed from the Blanton’s sister museum The Harry Ransom Center — including an 11th century manuscript depicting a zodiac dog, and a rare copy of the first published edition of Alice’s Adventures in Wonderland — are turned open to display specific pages illuminating the historical significance of cats and dogs over time. 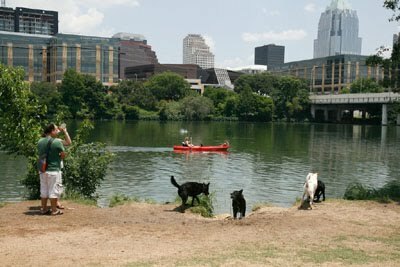 The exhibition is ideal for pet-friendly Austin, and will be a big hit with kids, too. An interactive room features places for children to draw their favorite pets and share pet stories, as well as play animal education iPad games and submit family pet portraits via an interactive gallery. In the Company of Cats and Dogs runs through September 21. The Blanton is open Tuesday through Friday from 10 am - 5 pm, Saturday from 11 am - 5 pm and Sunday from 1 pm - 5 pm. Admission is $9 for adults and free for all Blanton members and current UT-ID holders. Thursdays are free admission days. For more museum information, visit here.